(Verso) center, black ink stamp: "Copyright ©  by Hiro. All rights reserved./ This original photograph may not be reproduced/ by this or any subsequent owner without written/ permission of the photographer." (Verso) upper right, in pencil: "HI.056.1"
In the 1960s, while working for the fashion magazine Harper's Bazaar, Hiro created a series of photographs of various animals posed with jewelry. 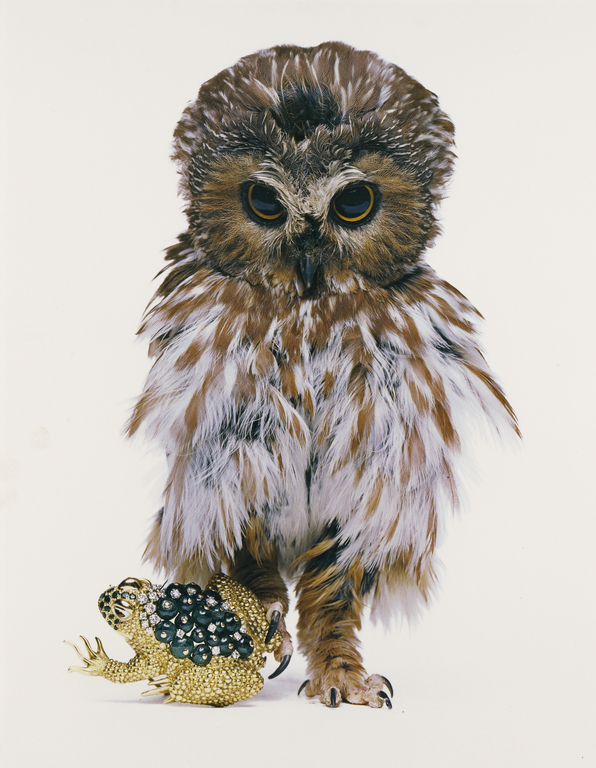 Here a small owl with slightly disheveled plumage examines an ornamental toad that it has steadied with one of its talons. The juxtaposition between a live bird and a precious object makes for a whimsical interpretation of a predator and its prey.